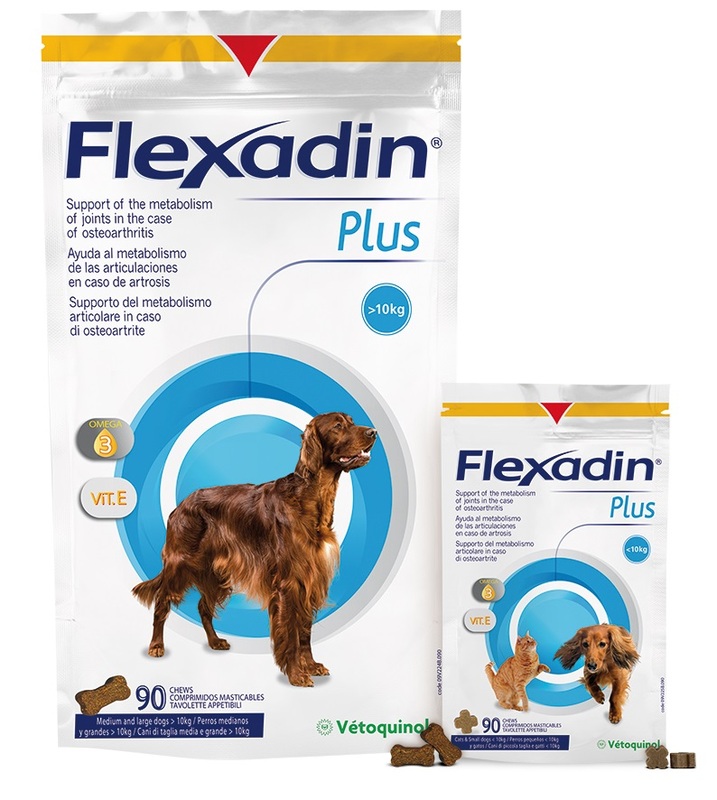 Flexadin Plus has been carefully formulated to support the metabolism of osteoarthritic joints in dogs and cats. Flexadin Plus contains the traditional joint support ingredients, glucosamine and chondroitin, plus a unique combination of essential components for the maintenance of healthy and flexible joints, such as vitamin E, Omega-3 fatty acids and Devil’s Claw (Harpagophytum procumbens). This is a dietetic complementary feed product. Formulated as tasty soft chews readily accepted by the majority of dogs and cats! Chicken liver, brewer's yeast, cellulose, glycerin, gum arabic, water, citrus pectin, maltodextrin, calcium alginate, sorbic acid, propionic acid, mixed tocopherols. Flexadin Plus is a tasty and soft chew, which can be given to your pet at any time of the day, by itself as a treat or with their meal. As is the case with the majority of joint support products containing glucosamine and chondroitin, the daily amount should be doubled for the first 4-6 weeks of use. Flexadin tablets contain glucosamine, chondroitin and devil's claw. It is to support joint health and function in dogs and cats.